As usual I am getting a bit carried away. For some weeks I have been threatening, from my little box thing on the right of each post, to give you a simple rocket (arugula) frittata. Here it is. But I also have a massive amount of sweet young courgettes (zucchini) to work my way through. I will try your patience over the next few weeks with a few courgette-based recipes, but I promise they will be easy, a bit different, and packed with flavour. All Scottish crops have grown like billy-o with their near-daily soaking, and courgettes are no exception. Rocket too. But I will give the courgettes a rest soon. In the meantime, bear with me as I work my way through many kilos of this easy to grow vegetable. You have been warned. Because of the courgette-using-up situation today it is a bit of a two for one deal, with a tweak of ingredients, but also a tweak of the size. 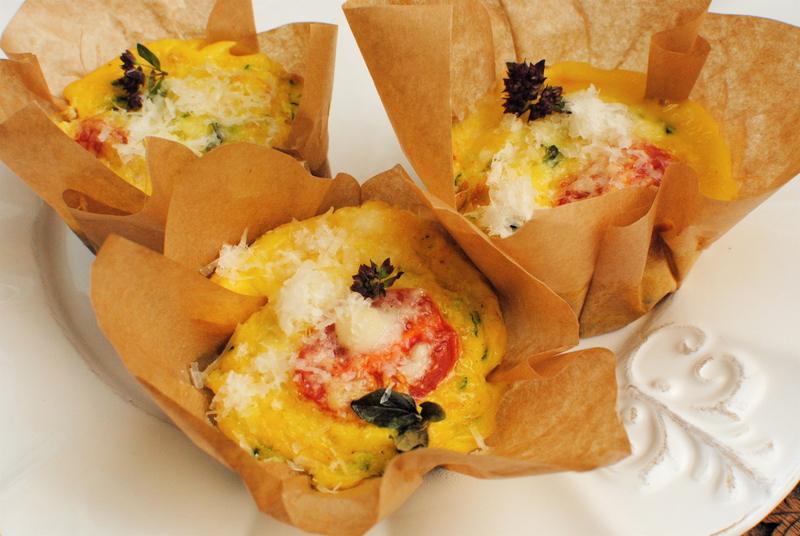 The mini frittata idea is not new but I thought I would bake dinky ones in parchment paper, like fancy bakeries do with their muffins. I think they are quite cute, and would look amazing all piled up on a big cake stand, still in their oven-browned papers. There is probably some art to making the papers look neat and tidy but I just cut squares of parchment paper and push them in muffin tin holes. I then use suitable drinking glasses to hold down the frankly awkward paper until I start to fill my ‘charmingly homemade’ (ie, messy-looking) cups. 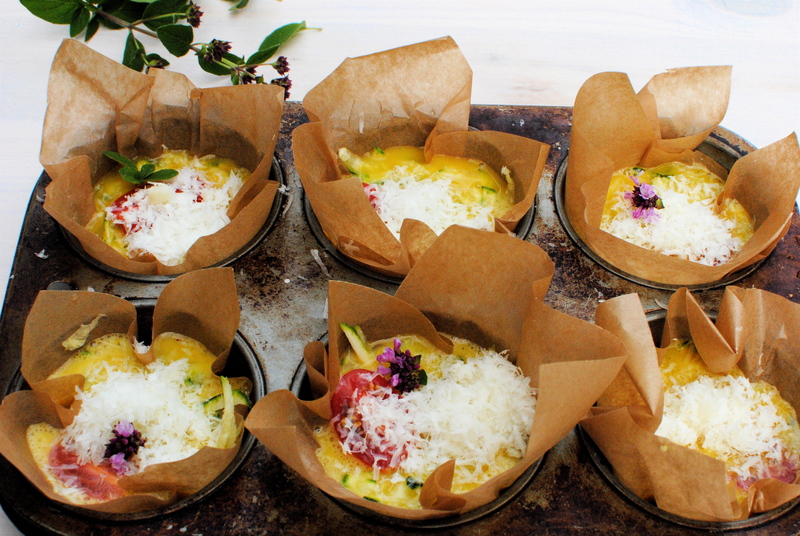 Not only are they cute, these crustless quiches – for that’s what they are really – are eminently portable, and would be a superb addition to a late summer picnic, buffet table and of course the dreaded lunch box. One or two paper-on quiches, with a wee box of carrots and cherry tomatoes, and maybe a sachet of ketchup nicked from a fastfood place, would probably be more than acceptable to most children. Perhaps with firm instructions to squirt the ketchup on the quiches and not on their shirt, or worse still, a classmate’s shirt. This is also a nutritious, easy to make and easy to eat meal or snack for if you are having treatment for cancer. Everything about it smacks of comfort, ease and digestibility. If you don’t fancy the courgettes or rocket, customise it to your taste by adding your favourite cooked vegetable, meat, herbs or cheese. Make it even more filling by having it in a sandwich with extra rocket or some salad leaves. We like it leftover for breakfast, with grilled tomatoes and plenty of ketchup. We are THAT sophisticated. Nutrition Notes: Courgettes are not blessed with an overabundance of nutritional goodies. That’s not to say that they aren’t good to include in a cancer-fighting diet. Just that they aren’t quite in the same league as the likes of beetroot, sweet potatoes and rocket. What this member of the cucumber and watermelon family does give us is folate, potassium and vitamins A and C, but not huge amounts as most of what’s in courgettes is water (which is in itself useful, of course). If you eat the yellow crookneck variety – most commonly grown in the US – you will also get a decent whack of eye-protecting lutein and zeaxanthin, both powerful antioxidants. With the skin left on you are getting fibre too. And lastly, they are a dieter’s friend, with only 18 calories per 100 grams, due really to the high water content. Look here for more nutritional information and preparation advice. Rocket on the other hand has an embarrassment of nutrients. As a peppery-tasting member of the mighty brassicaceae family, rocket (or arugula if if you prefer) is packed with cancer-busting phytochemicals such as indoles, thiocyanates, sulforaphane and isothiocyanates. Believe me when I tell you that these are very potent indeed. All of these compounds are known to inhibit the growth of prostate, breast, cervical, colon and ovarian cancer cells. Additionally, di-indolyl-methane (DIM), a metabolism by-product of indole, has immune modulator, anti-bacterial and anti-viral properties. It is currently being tested in Phase III clinical trials for treating cervical dysplasia – a precursor to some cervical cancers. Other nutrients, less showy but very important, include vitamins A, C and K (one serving of rocket gives of 90% of our RDA for the latter), as well as copper, iron and most B vitamins. It is best raw but a lot of the goodness remains when used in this recipe, as it wilts rather than cooks. No room to bore for Britain on eggs. Another time. 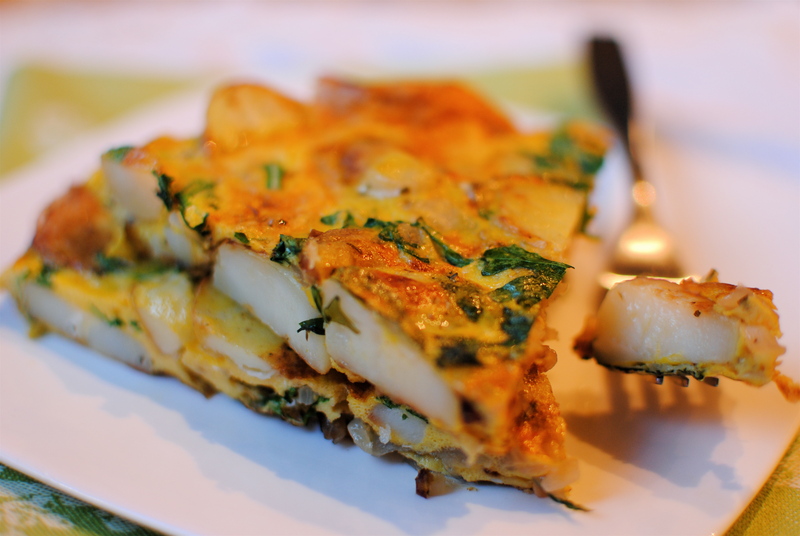 The basic frittata recipe consists of eggs, onions, potatoes and olive oil. These can be jazzed up according to whatever else you have in the cupboard or fridge. Leftover boiled potatoes are perfect for this recipe, but you can leave them out entirely. 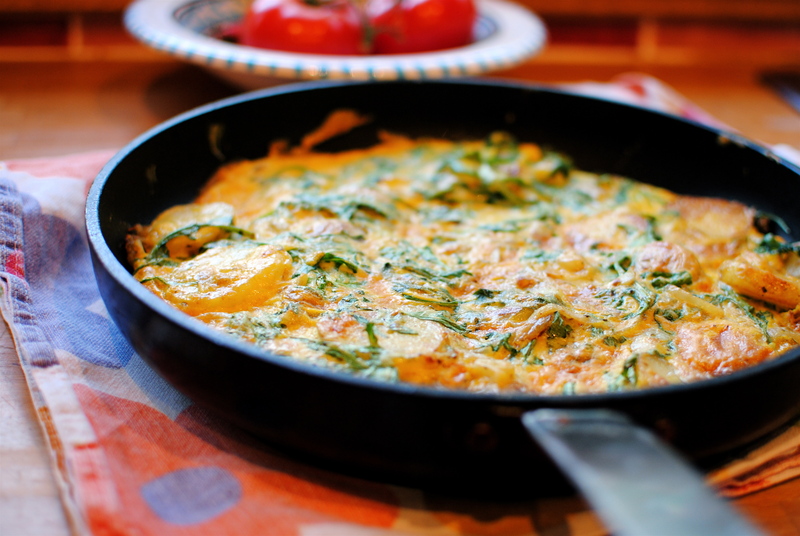 For the family I often do this one with spinach, turmeric and mustard or nigella seeds. This is a super speedy and yummy supper with fresh bread and a sharp green salad. It is also nice cold. In the frying pan, heat the oil over a low to medium heat. Add onions and saute for a few minutes, then push aside and saute the sliced potatoes and garlic for a few minutes. Evenly distribute the rocket over the vegetables. Beat the turmeric and milk or water into the eggs. Pour the seasoned eggs into the pan. Let the mixture semi-set over a low heat. I usually cover the pan for most of the time. Finish off under a hot grill or, if you are brave invert the frying pan onto a plate and slide the undercooked side back into the pan to finish. The undermost side will probably be quite golden brown with ‘caught’ oniony bits. This is the way it should be – you haven’t burned it. Let it cool to almost room temperature (it doesn’t taste nearly as nice straight from the pan.). This also tastes fab cold and is perfect for picnics and lunchboxes. Serves 4. Party, lunchbox, picnic, snack version of the above – sans potatoes (because they need more room) and with a bit of cheese. First thing to do is cut appropriate sized parchment paper squares for the tin holes. You want it to stick up quite a bit so that the filling doesn’t leak. 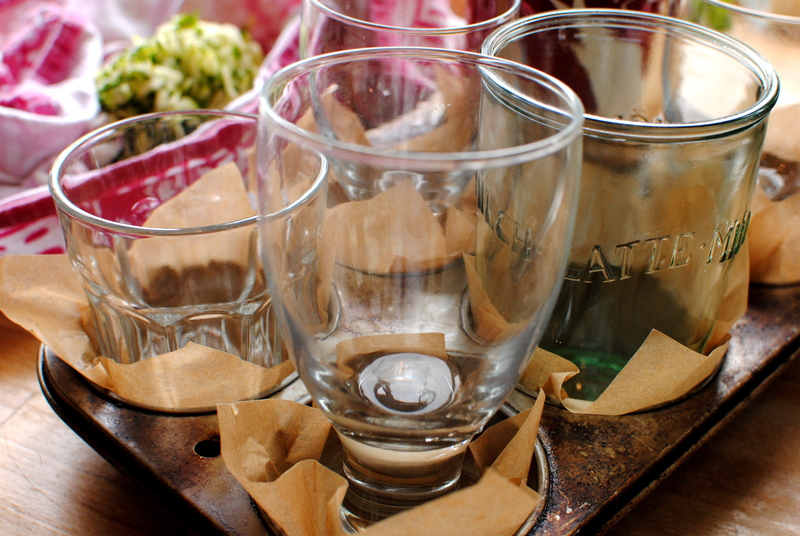 Weight the papers with some drinking glasses or small tins. 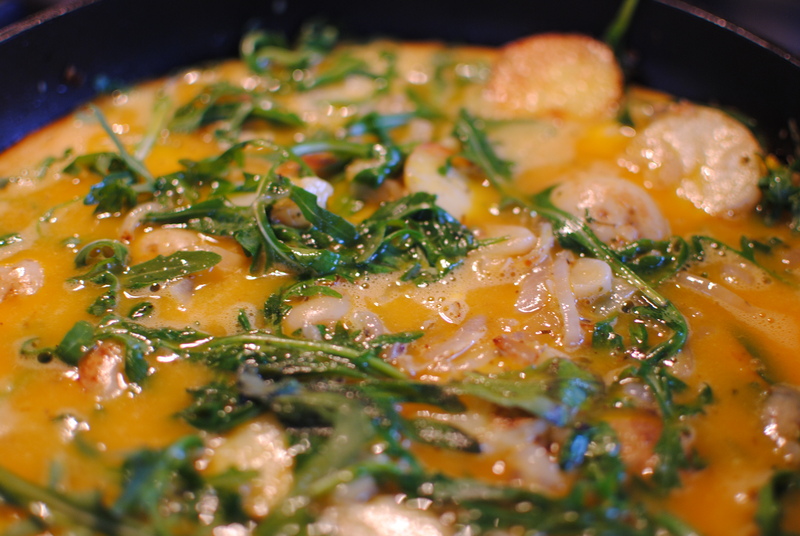 Gently sauté the onion over a low-medium heat, adding in the herbs just to heat through and become fragrant. 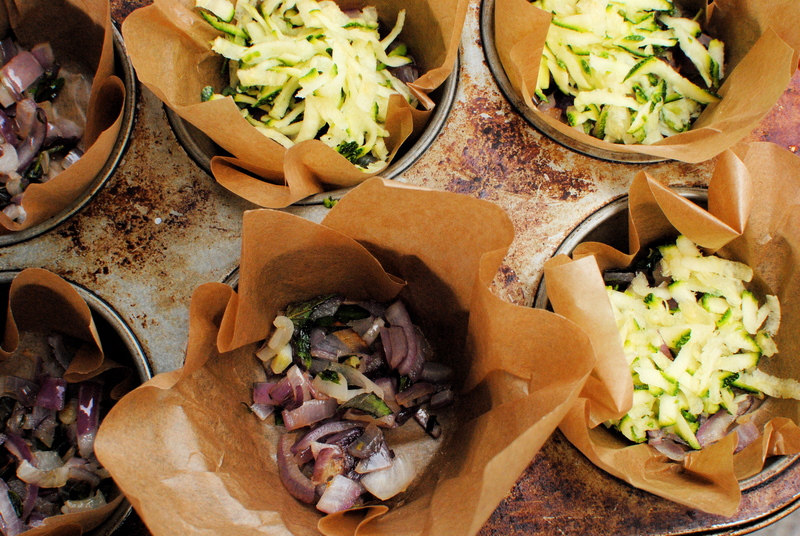 Spoon equal amounts of onion into the paper cups; top with a good pinch of courgette. Now whisk the eggs with a tbsp of milk or water and add some seasoning; pour in equal amounts of the egg and top with a halved cherry tomato and a sprinkle of cheese – saving back a little extra for serving. Bake in a 180C/350F oven for 12-15 minutes. Serve warm rather than hot, with some salad and grainy bread. And lots of ketchup. 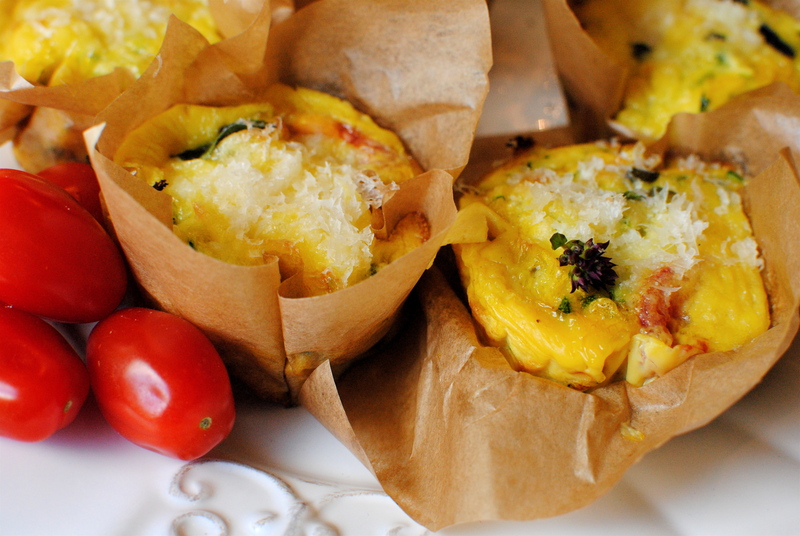 Adore the tempting Dinky Frittatas! I can envision using cute little cupcake papers in the muffin tins, oh my! Thanks for sharing the nutrition information, as it is helpful in menu planning. Oh, do it in the parchment! 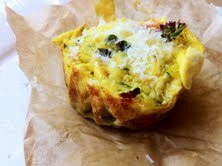 Unless you have big ol muffin papers, that is. Just thinking of rise and overspill, and your oven… I do go on a bit with the nutrition but my ‘core’ readers through my cancer nutrition courses find it useful & I am a frustrated teacher at heart.. Hope it doesn’t scare off other folk though. Have a wonderful day, Deb. Both recipes look lovely and I’m looking forward to making them. I’ve only recently thought of grating courgettes. I sometimes have too many as well, not because we grow them, but we get a weekly box of organic veg. which sometimes has them in it. I’ve used up a few over the summer by simply grating them with carrots for a simple salad. Your recipe is much more exciting! Shirley. Thank you Shirley. I find courgettes really useful as ‘fillers’ as they aren’t assertive but fresh ones have a lovely sweetness and crunch that is irresistable, as you’ve probably found in salads. Underrated veg. If you have a lot to get through and fancy something sweet, have a look at my Courgette, Lemon & Elderflower Cake recipe – tasty, moist and quite healthy for a cake. Another idea, that we do a lot, is make up some quinoa (or rice), grate in courgette, squirt in lime, add some toasted sesame oil and sesame seeds – good side for grilled fish. Hi Jackie.That’s an interesting website that I will take time to peruse. As for Vitamin Water, yeah, what a con. I almost bought one a few years ago in the US but luckily I looked at the label and was horrified by the ingredient list. No use having all of those added synthetic nutrients when you add colouring and as much sugar as many soft drinks. It’s rubbish that folk drink them thinking it’s going to help substitute for their lack of a healthy, plant-filled daily diet. WE know better, don’t we Jackie! to think i was drinking that rubbish before i had cancer and thought i was being healthy, we do know better. The photos here are really prettym I love how cute they look when they are ready to bake. As always, lots of fantastic information on the nutritional qualites here. 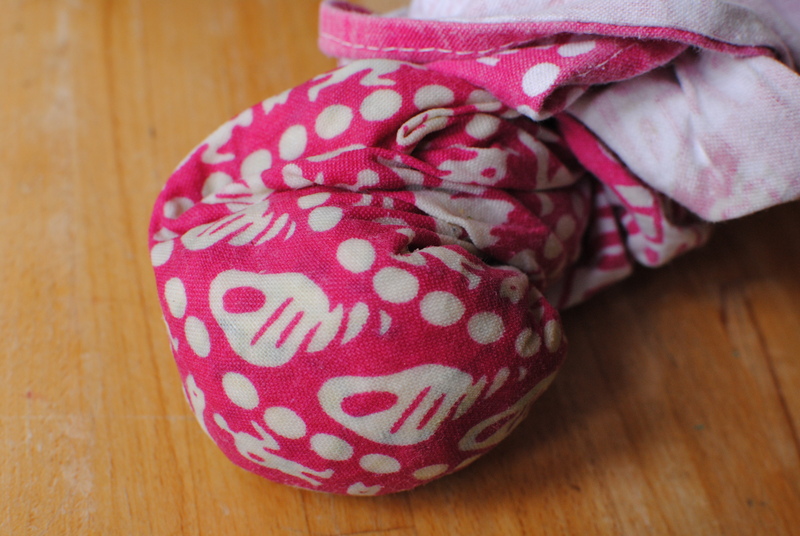 Thank you so much for linking with Simple and in Season. Thanks for your kind comment. 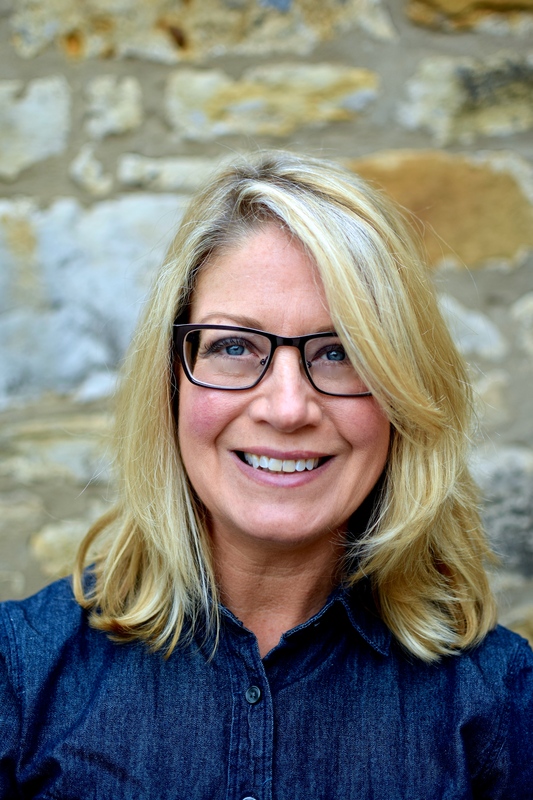 Because of my job and why I started the blog in the first place (interesting food for those going through cancer treatment and recovering from treatment), I feel it is part of my self-imposed remit to highlight the nutritional goodies. Sometimes I get carried away, but then I try to balance it the next post with more chat and less heavy info. I like doing the research too – keeps me on my toes. Glad you appreciate it. And thanks for Simple and In Season. Great concept: Everyone look at Ren’s site!